Shabazz Napier was never going to fade away quietly into the basketball background. If you remember anything about this kid from Roxbury, Mass., you knew that. He may be six-foot-nothing, 170-and-nothing, a veritable midget by NBA standards, but as he showed when he trail-blazed Connecticut to its most stirring and improbable national title, he’s got the fight of Jim Calhoun in him. He had plenty of reasons to quit, to believe the NBA might just be too much for him, to try his hand in Europe or resign himself to schooling a bunch of kids in the G League. Napier averaged just 5.1 points and 2.5 assists in 19 minutes per game in his rookie year with the Heat, where he was traded after LeBron called him his “favorite player in the draft!” and said, “no way u take another pg in the lottery.” Of course, LeBron bolted for Cleveland before that season started. Miami gave up on him after year 1, trading him to Orlando, where he earned just 10 minutes of run per game and put up 3.7 points and 1.8 assists in 55 games. He played even less in his first year in Portland last year, averaging 4.1 points and 1.7 assists in 9 minutes per, but came on like 2014 UConn late, running up a career-high 32 in an April upset of the Spurs, and logging meaningful minutes in the Blazers’ first-round playoff series against Golden State. Napier started out slowly again this year, but after injuries to CJ McCollum and Damian Lillard, he’s taken on a key role for Portland, which sits at 18-16 and in seventh in the crowded West. Shabazz scored 19 on 7-of-12 shooting in a November win over Orlando, then went for 16 against the Grizz and 15 versus the Pelicans, before earning some serious minutes in late December in the absence of Lillard. He’s scored in double figures in five straight games, and recorded 21, 5 dimes and 3 steals in a 95-92 win over the Lakers on Saturday before leading the Blazers to a comeback win over Philadelphia in Portland on Thursday night. He looked like the Shabazz of old, using his guile, court smarts, street toughness and craftiness to puzzle the Sixers. If you knew Shabazz, you knew this was always going to be the outcome. He may not have the size of a Rudy Gay, or the all-world quickness and handle of Kemba, but there’s a reason this kid led an unheralded seven-seed on a March run no one in Connecticut will ever forget. 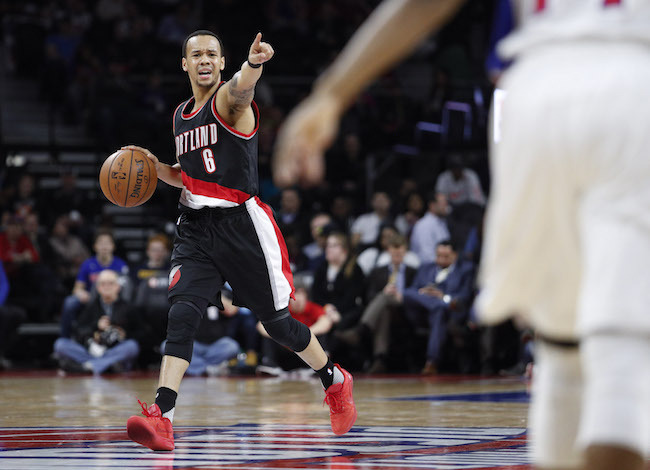 It may have taken some time, but Shabazz Napier is right where he always expected to be. We probably should have expected it, too.